Want to be the first to hear about upcoming workshops? Fill out the signup form! 100% spam free. Now, arguably more than ever before, the art of communication is a crucial asset. New media and decentralized methods of storytelling bring new voices and fresh perspectives to the forefront of culture and discourse each day. But with more content comes the challenge of attention. With so many stories out there, how do you ensure your ideas and stories are captivating the audiences you want to reach? In this 5-week workshop, study genre-spanning prose in the contemporary publishing landscape, give and receive feedback on drafts, and generate new writing. 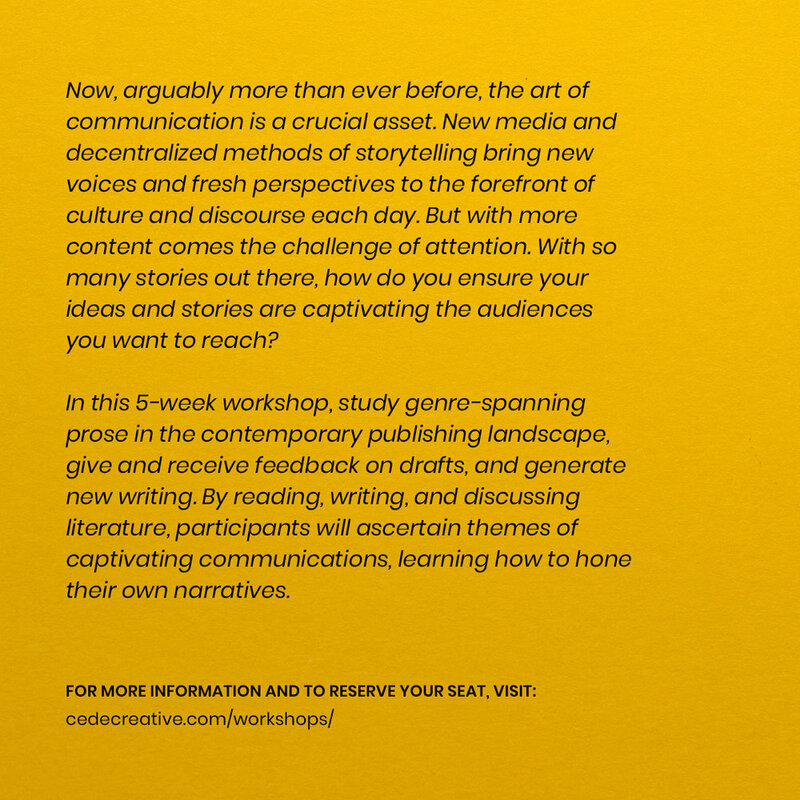 By reading, writing, and discussing literature, participants will ascertain themes of captivating communications, learning how to hone their own narratives. Instructor Elizabeth de Cleyre holds a BA and MFA in creative writing, studying with authors and writers Paul Harding, Lidia Yuknavitch, Kate Christensen, and Michele Filgate, among others. As an editor and publishing consultant, she’s guided over 70 writers and authors to publication. Her essays and reviews are published in Ploughshares online, Brevity, The Review Review, Barstow & Grand, and ayris. For the first week, participants will discuss assigned readings, receive prompts, and a rundown of how the rest of the course will run. For the second week, participants will discuss assigned readings and receive prompts to work on at home. We will workshop 2 participant drafts. For the third week, participants will discuss assigned readings and receive prompts to work on at home. We will workshop 2 participant drafts. For the final week, we will discuss readings related to publishing, pitching, and sharing your writing.